I was looking forward to a lazy Sunday for a few weeks now. The last little while has been fun and hectic, so I figured a day off would be okay. Sadly, it wasn’t as much fun as I had hoped. Little Donner is STILL at the vet’s. It’s taking a long time for him to get better. They can’t let him come home until there is no more blood in his urine. There still was this morning. Poor guy. SO, we stayed home today and watched about a hundred episodes of Dr. Who, waiting for the phone to ring. They told me to call back after 6:00, so in a few minutes I’ll give them a call and find out his status. I never, ever expected him to be there this long. He’s out-stayed Oscar’s mega string removal surgery by 2 days now. 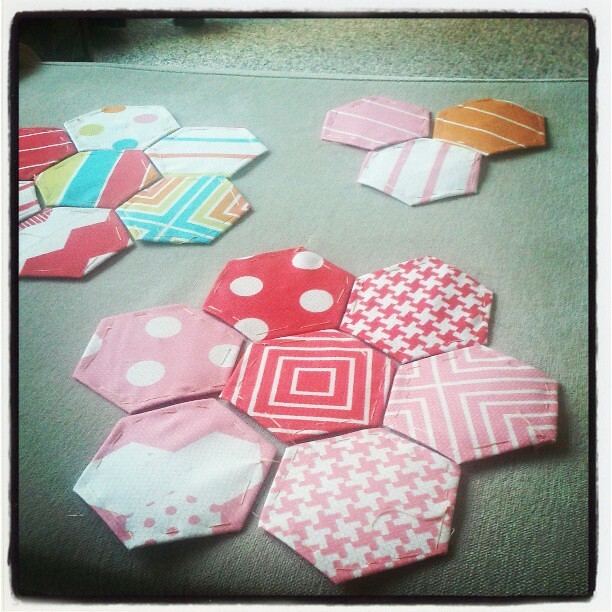 I kept my hands busy making these hexagons with a charm pack I won at the last quilt guild meeting. I always manage to leave with more than what I take there, that’s for sure. I think it needs some solid gray hexagons…I’m a bit gun shy after making that last quilt top with all the patterns on it. It was a little bland for me, even with the Halloween motifs on them. Tonight is game 2 of the Bladezillas play-off game, and even though I’m not too much in the mood to go out, I think we’ll go anyway and cheer on the team and take photos. This entry was posted in Sewing and tagged hand piecing, hexagons, I miss my kitty, Not in the mood. 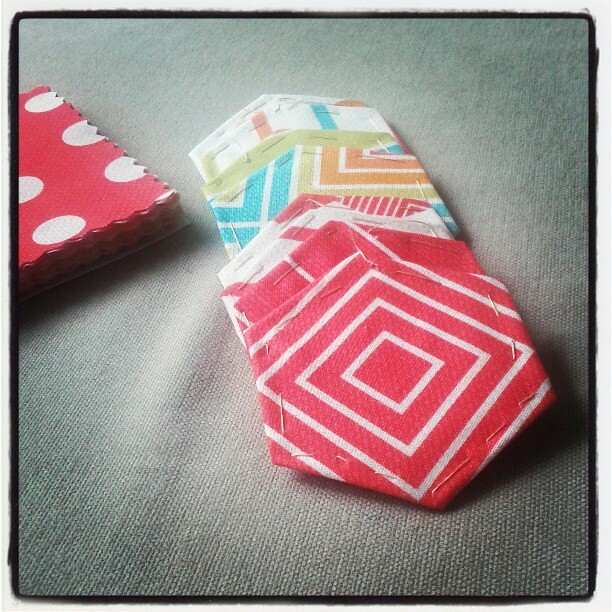 At all..
Ooooh pretty hexies!! They are addictive to make that is for sure. I hope Donner gets to come home soon! When Bucky had it done he was at the vet’s for almost 2 weeks, and they wouldn’t let us come see him! By the end they couldn’t even reach in, he would hiss and scratch the vet tech- serves them right. Norm had to go in & get him out of the cage to bring him home & he willingly ran into his carrier like get me outta here already! So I’m glad you can go in & say hi to him til he’s ok to go.. Sending him good healing vibes! !